You'd think after Spirit Airlines' past year — snagging a spot in Consumerist's ‘Worst Company in America' bracket, receiving widespread criticism for majorly failing to respond to an alleged sexual assault complaint, etc — the company might have wanted to, shall we say, "fly" under the radar for awhile. Apparently not! 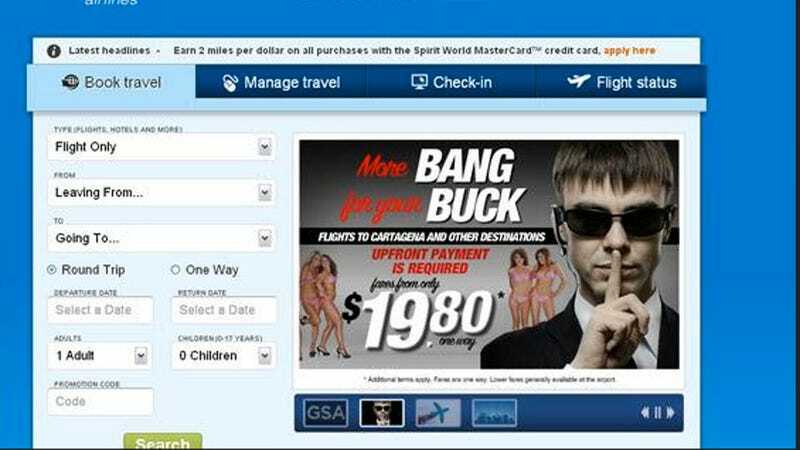 Last week, the airline attempted to spoof the still-developing Secret Service prostitution scandal and offered customers cheap flights to Catagena, Colombia, where they could receive "More Bang For Your Buck." In case you didn't get the joke, the ad featured a James Bond-type fella with his finger to his mouth — Shhhh, don't tell anyone about the hookers! — girls in bikinis, and a line about how "upfront payment is required." Hilarious, right? Nope — no one thought so, so Spirit Airlines pulled the ad this weekend and released a statement apologizing to "our many friends and valued customers." Oddly, the company didn't apologize to the Colombian government, which requested the retraction in the first place. Maybe they were too busy refusing to refund a dying man's ticket? Looks like we should start brainstorming the most offensive jokes we can make once Spirit Airlines goes out of business.